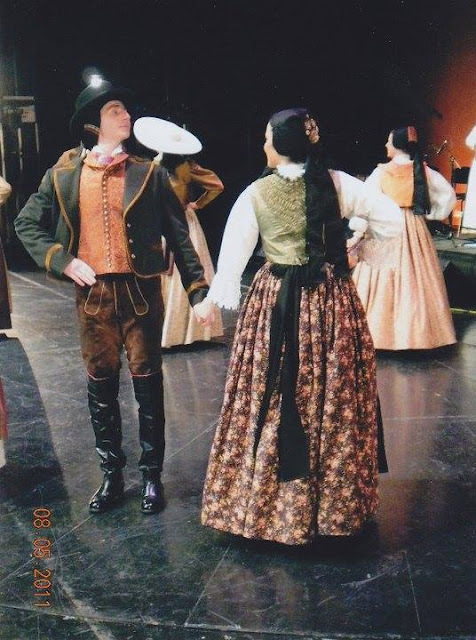 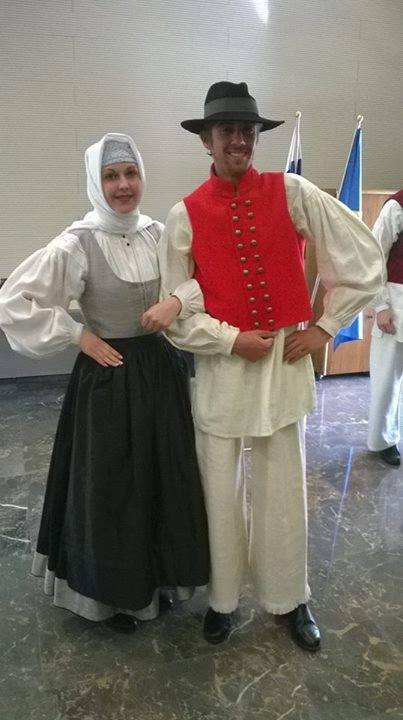 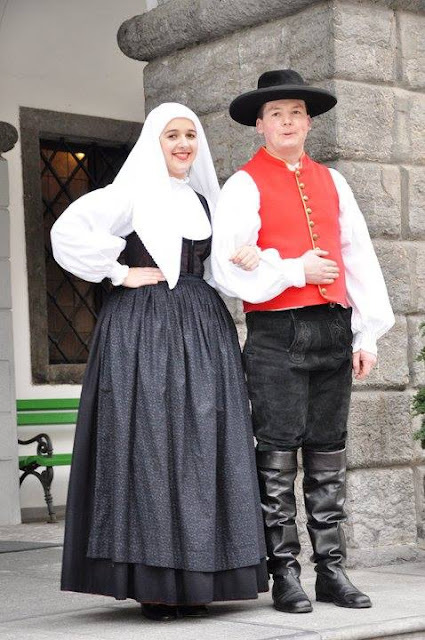 Today I would like to give somewhat of an overview of the costumes of Slovenia and the Slovenians. They call their country Slovensko, but be aware that the Slovaks also call their country Slovensko. 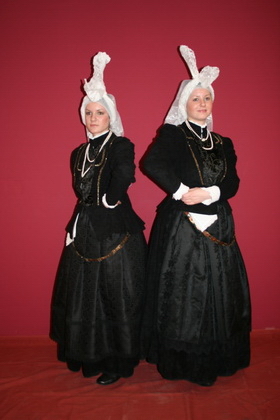 Be careful not to confuse the two. 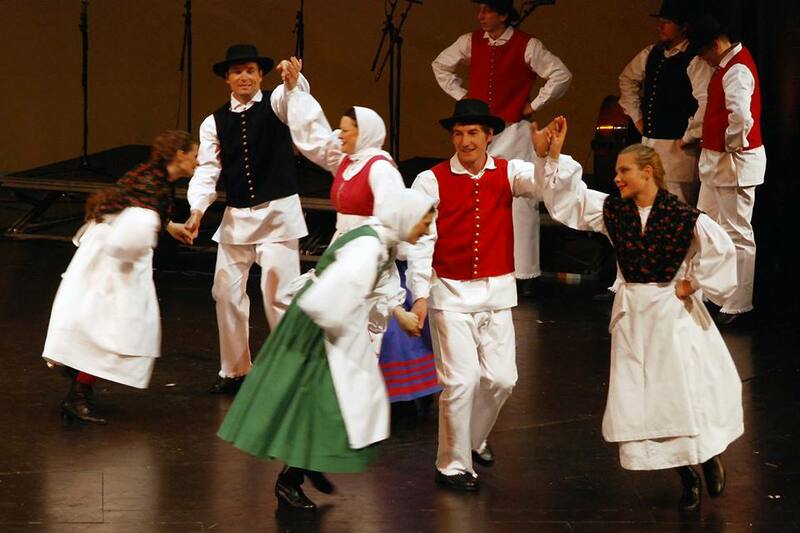 Slovenians live in Slovenia, and also in some neighboring parts of Italy, Austria and Hungary. 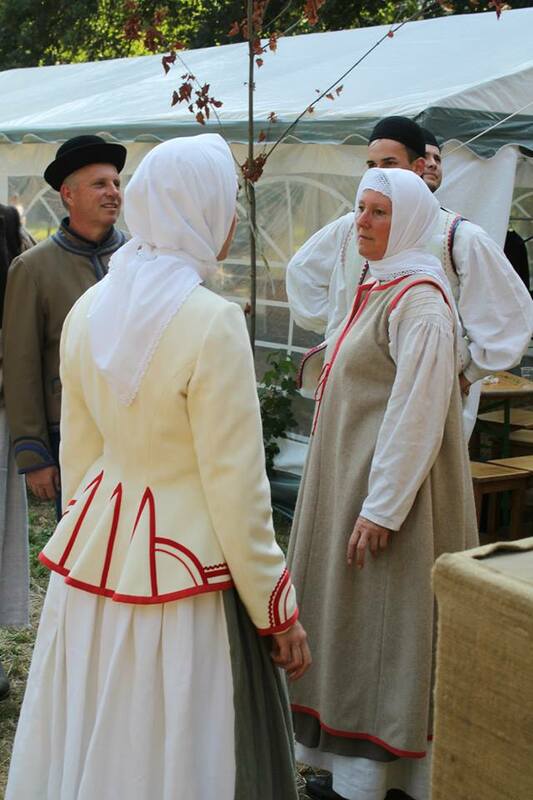 They intergrade with the Croatians in dialect, and the border is taken as the dividing line between the two. 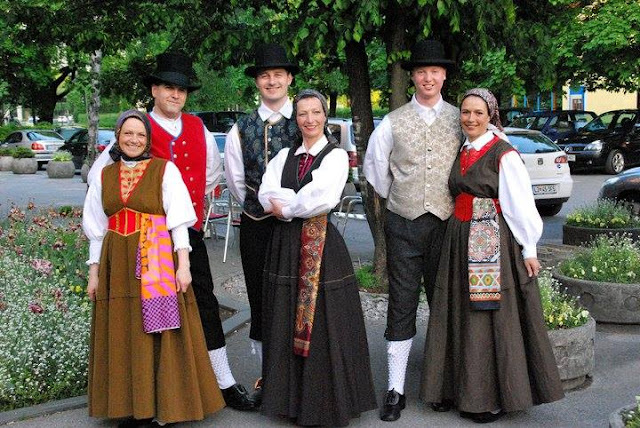 Being in a mountainous region, the Slovenian language has a large number of dialects, The most divergent are Rezian in the west and Prekmurjan in the east; each of which has a separate literary standard. Here is a map of the traditional regions of Slovenia. 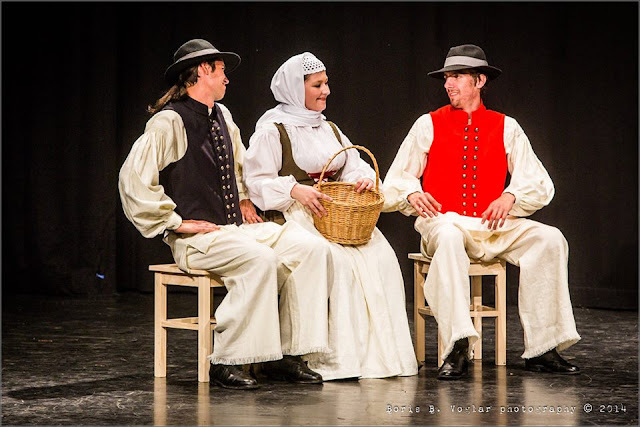 The three regions in red reflect their common history as the province of Carniola or Kranjska in the Austrian Empire. 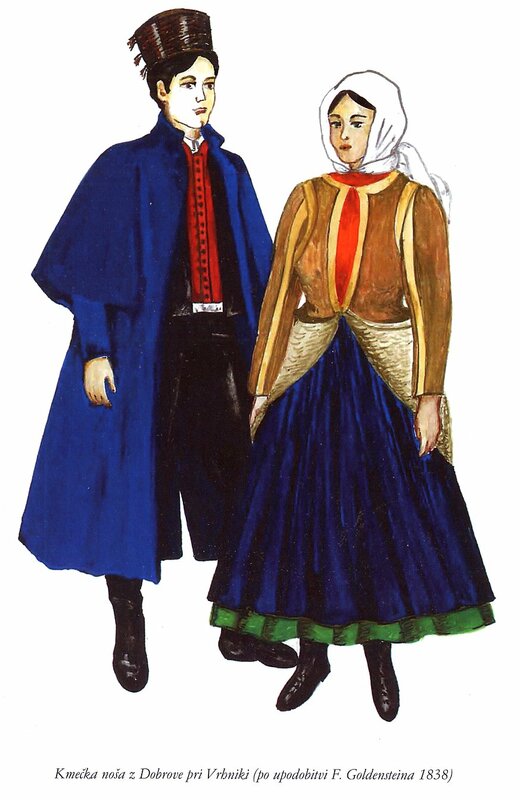 The image at the head of the article is of the Gorenjska, or Upper Carniola costume, which is by far the best known. 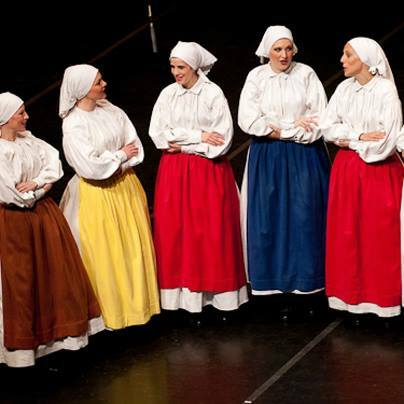 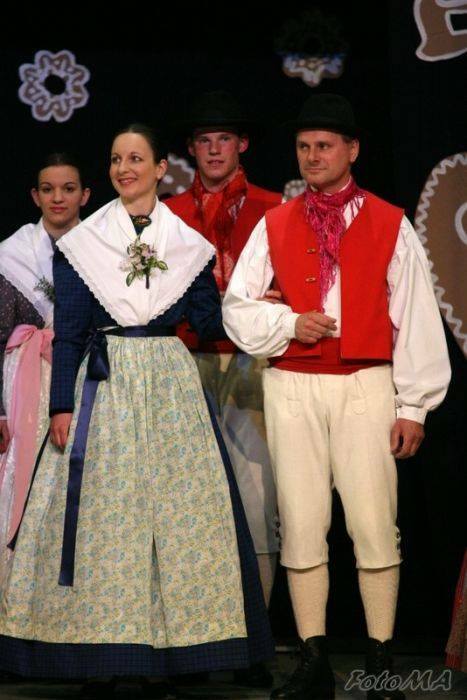 This is what people generally think of as 'The' Slovenian costume. 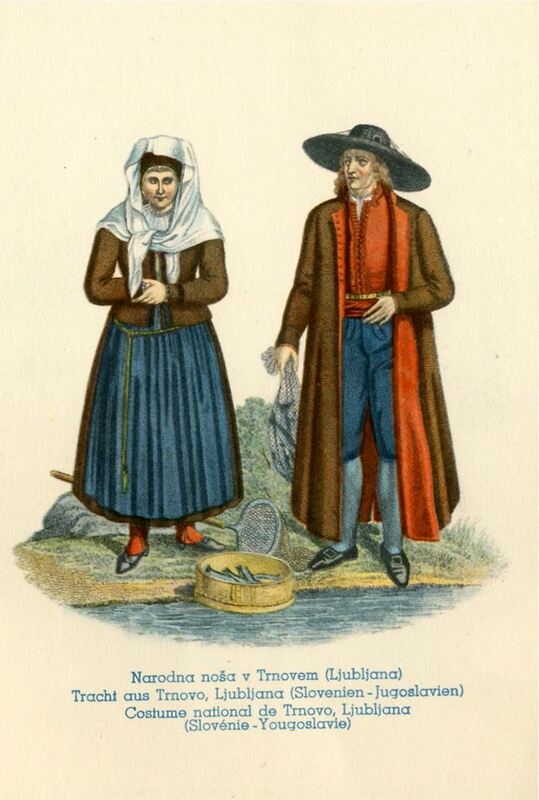 This comes in several variants. 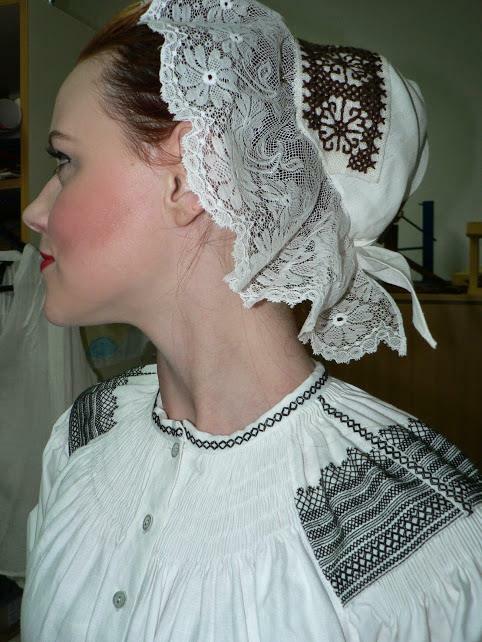 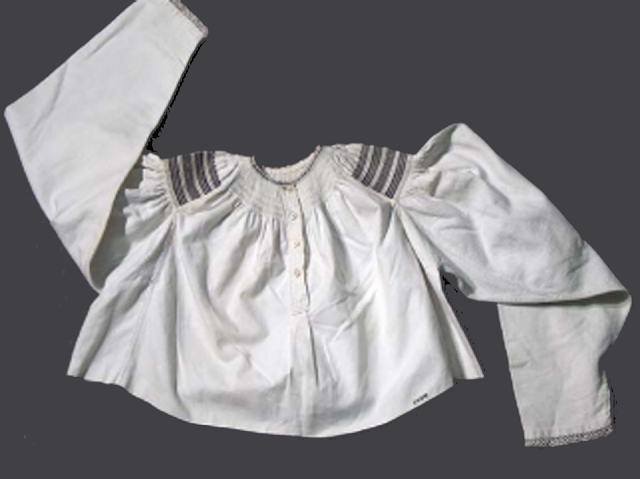 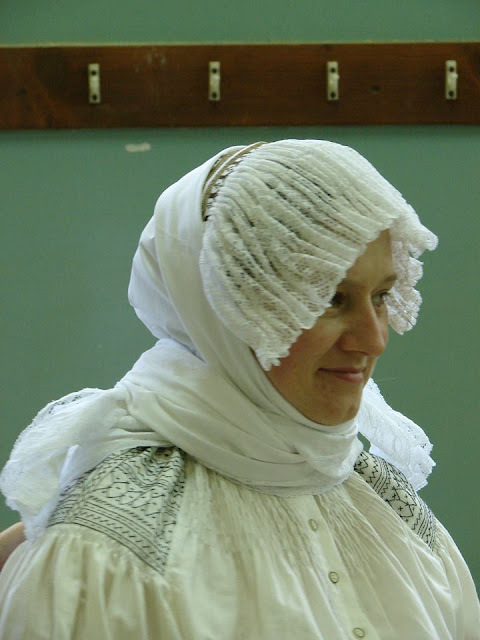 Sometimes a Spencer jacket is worn as part of the costume, and sometimes a large starched white kerchief is worn with the ends tied on top of the head, instead of the distinctive headdress. 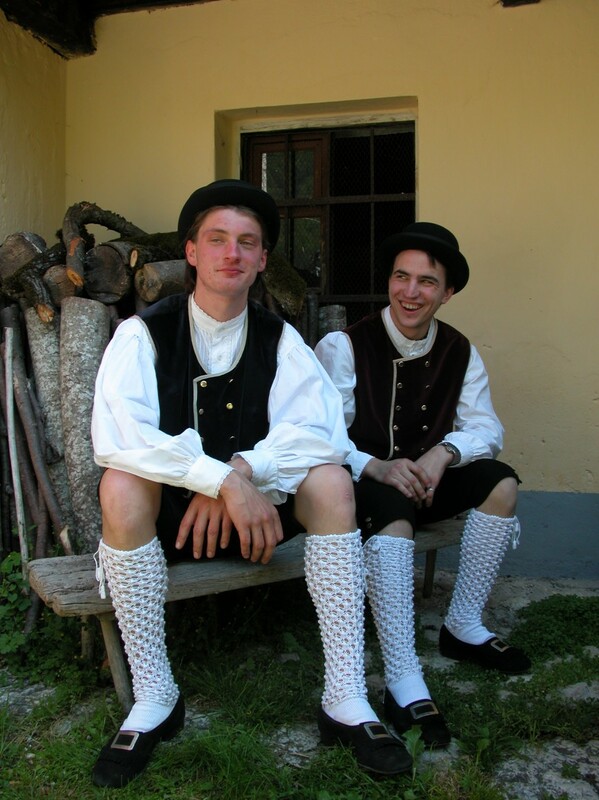 The capitol of Slovenia has particular costumes associated with it. 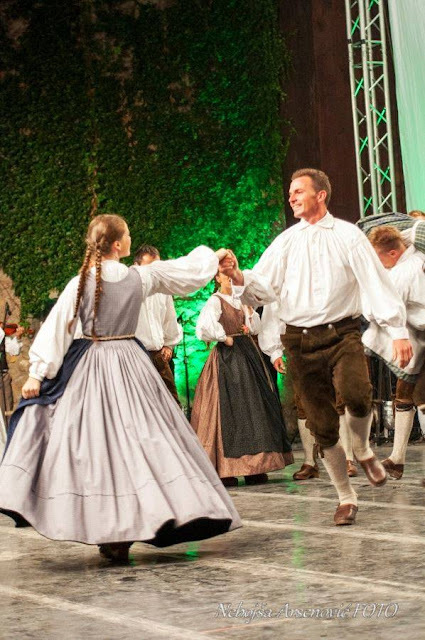 A video of some dances from Ljubljana, the capitol. 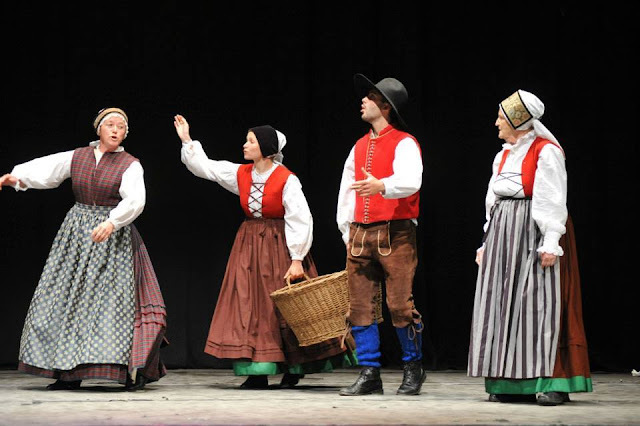 To the south, the province of Dolenjska or Lower Carniola, has a somewhat different costume in the northern parts. 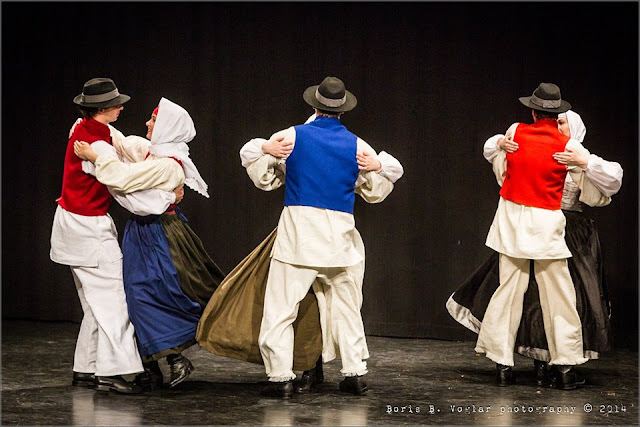 Here is a video of dances from Dolenjska. The costumes from south central Dolenjska resemble those just across the border in Croatia, in the regions of Delnica and Kordun. 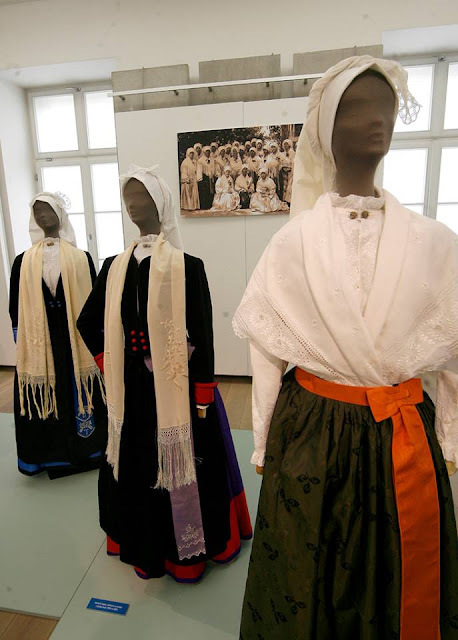 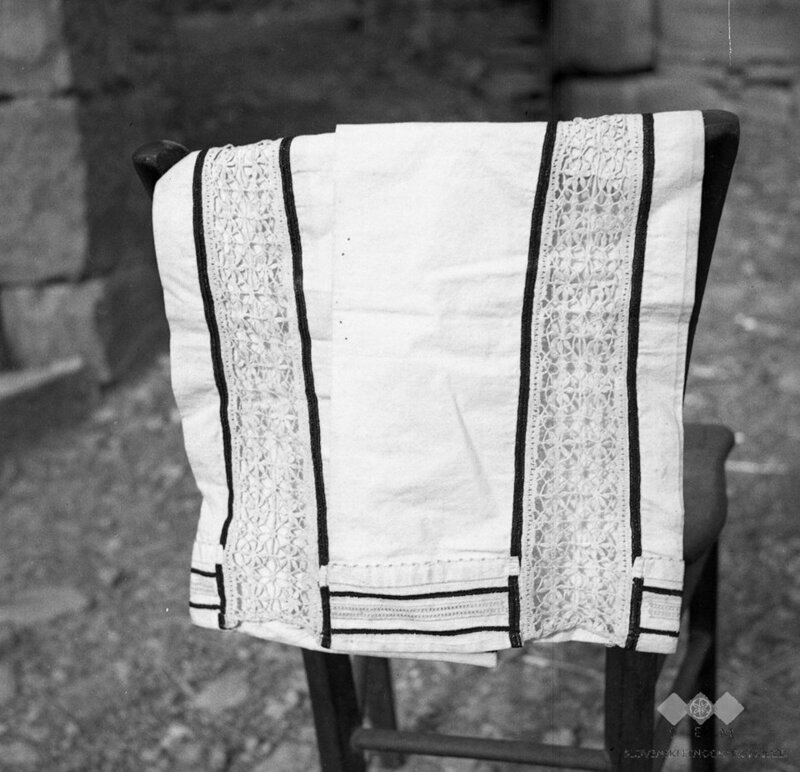 In the southeast corner of Dolenjska, around the city of Črnomelj, is the region of Bela Krajina [White Country, or Whitemarch].This has a very well preserved and distinctive costume, almost all in white linen. 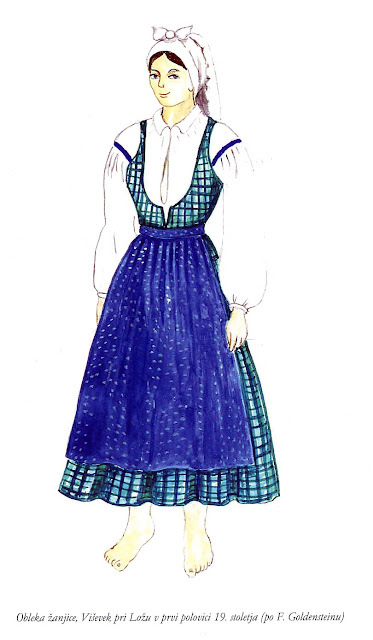 This apparent simplicity is belied by the complex construction and sewing details of the costume. 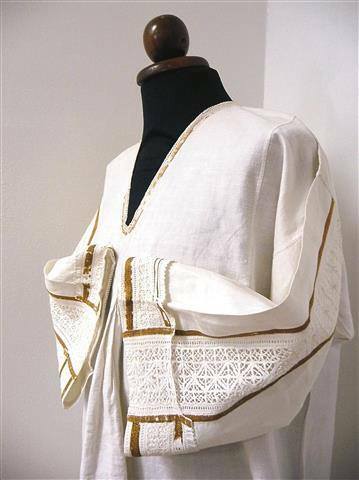 some embroidery enlivens the all white costume. 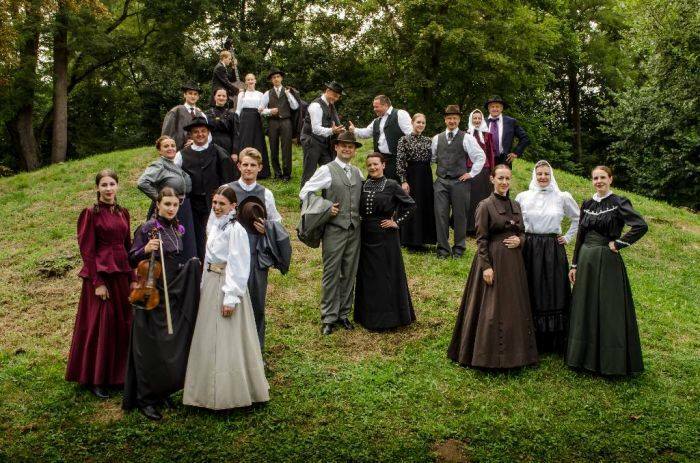 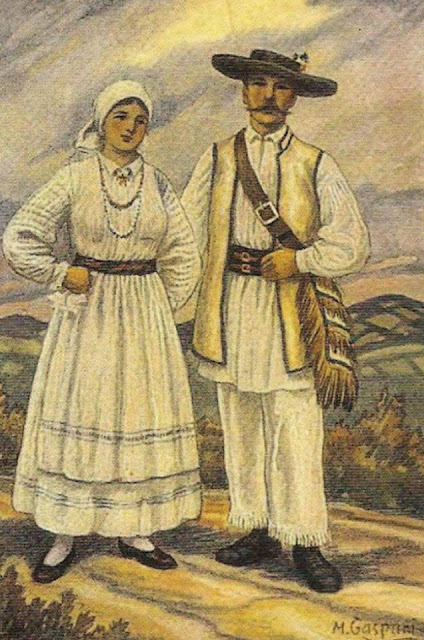 Later, for special occasions the people of Bela Krajina would put on city type costume, known in the region as 'black costume'. 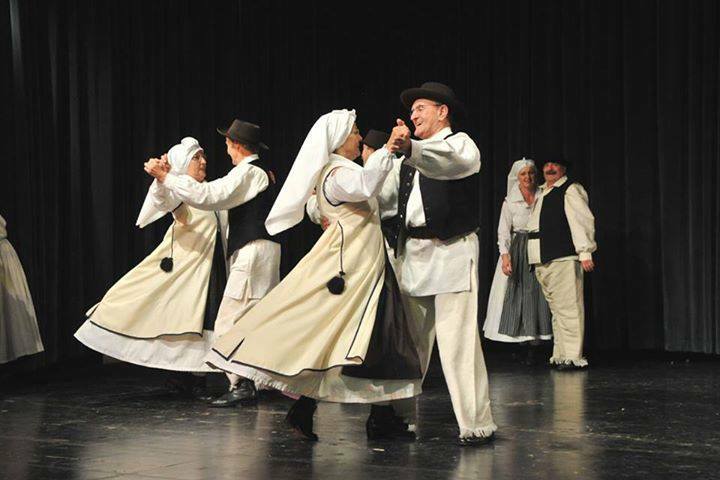 Videos of dances from Bela Krajina. 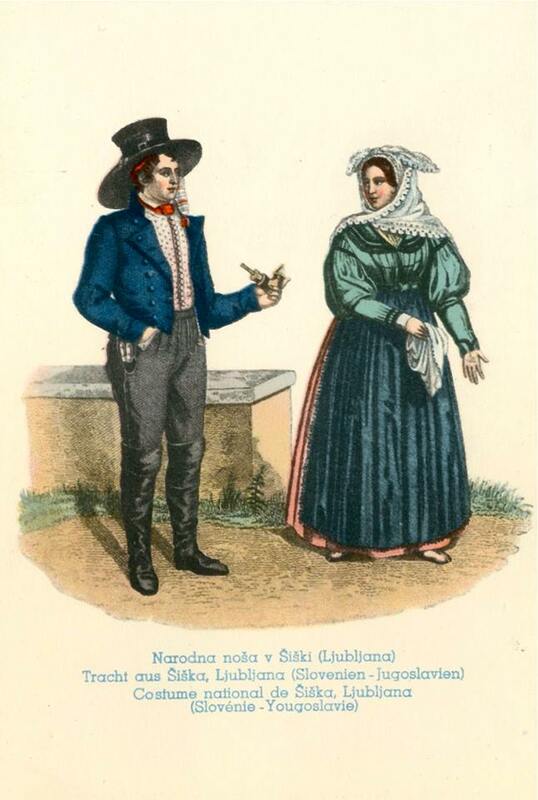 For the region of Notrjanska, or Inner Carniola, I have found very little in the way of remembered costume. 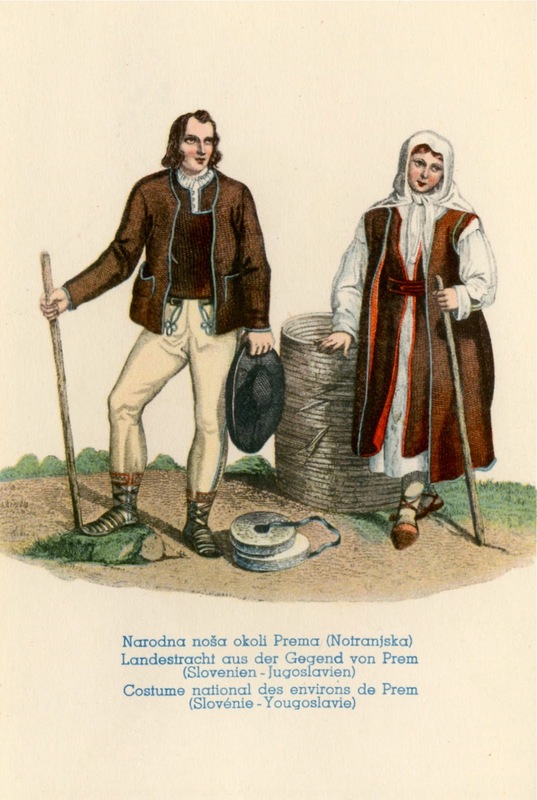 This couple is from the area around Vrhnika in northern Notrjanska. 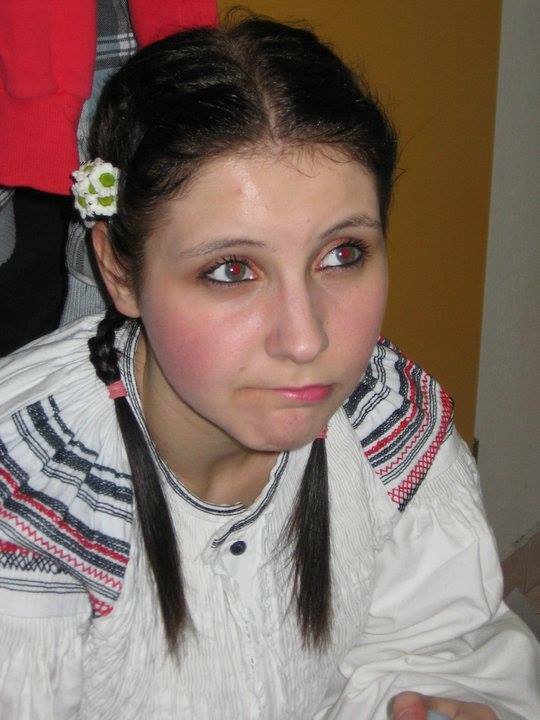 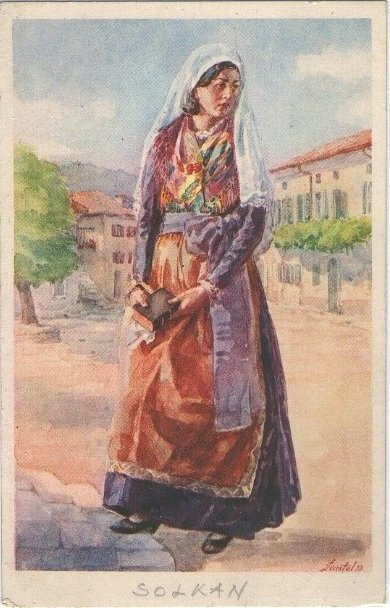 This girl is from Viševek in southeastern Notrjanska. 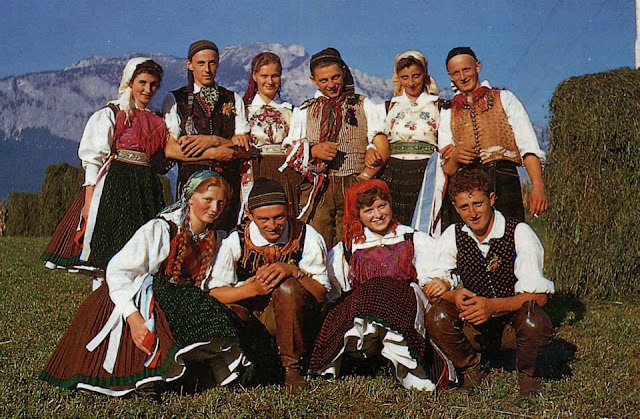 The following are from southwestern Notrjanska, specifically the Brkini Hills. 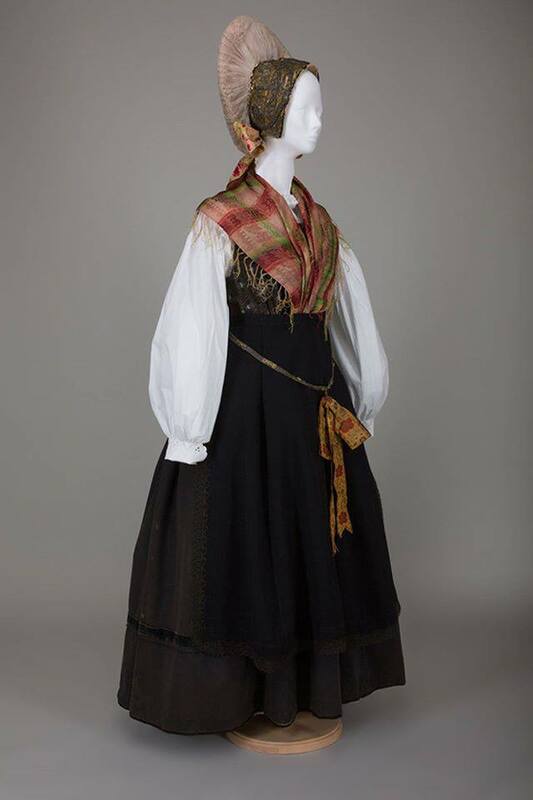 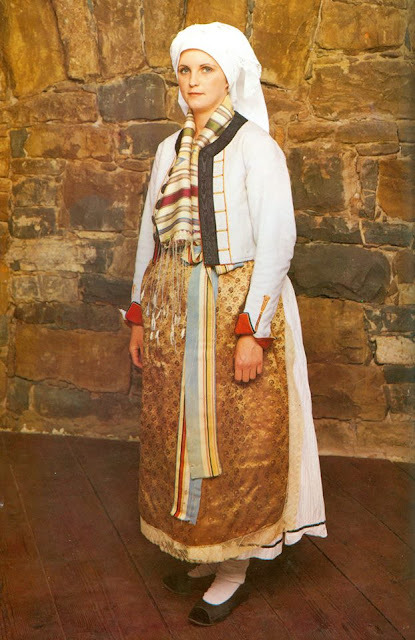 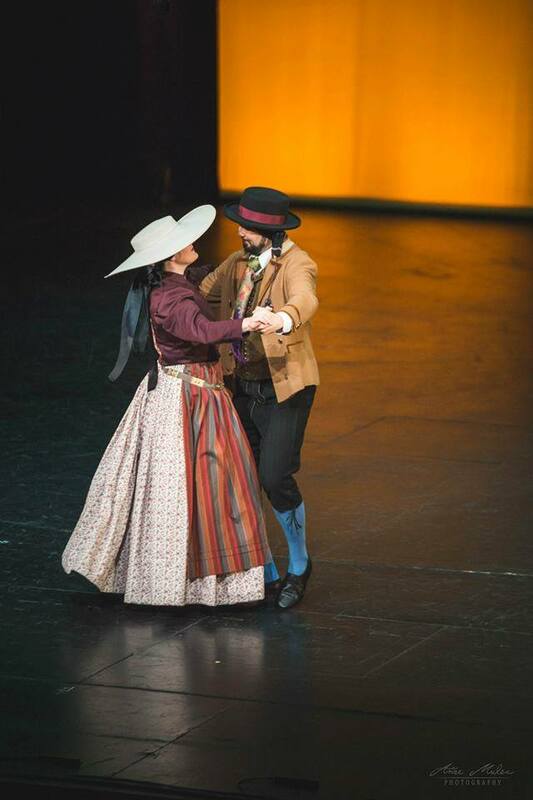 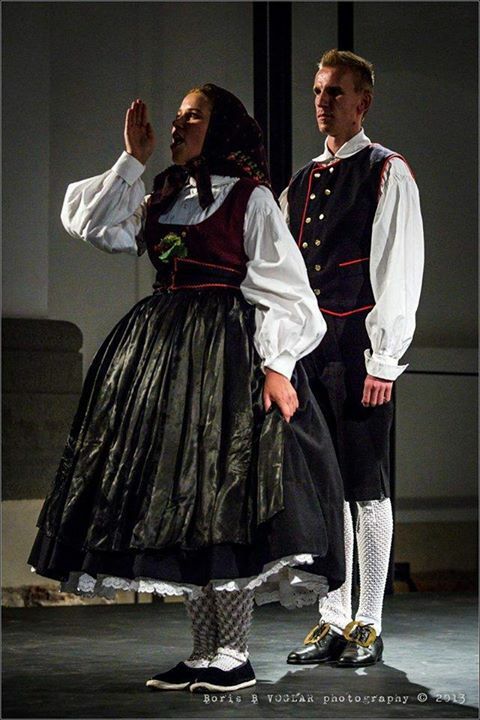 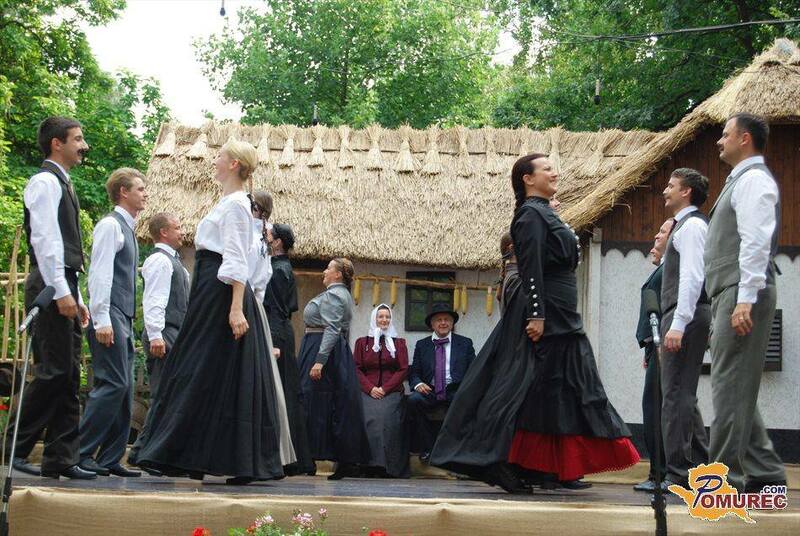 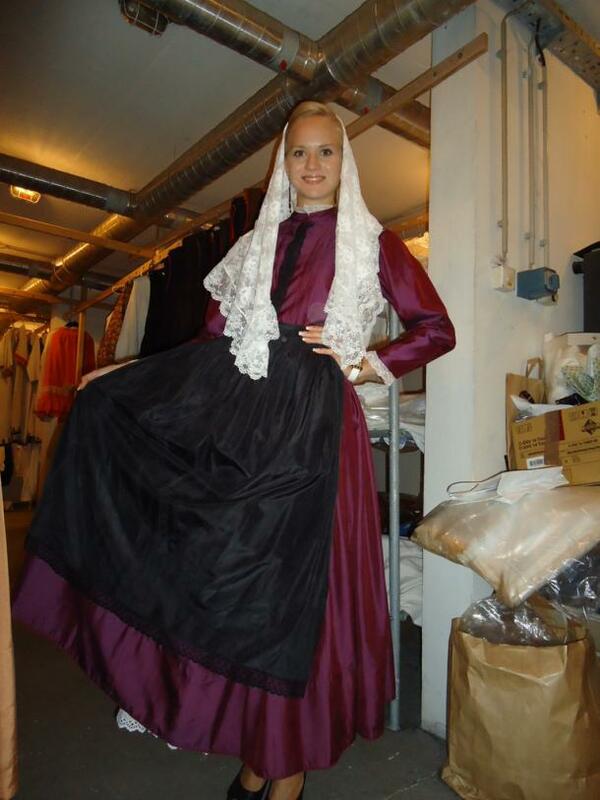 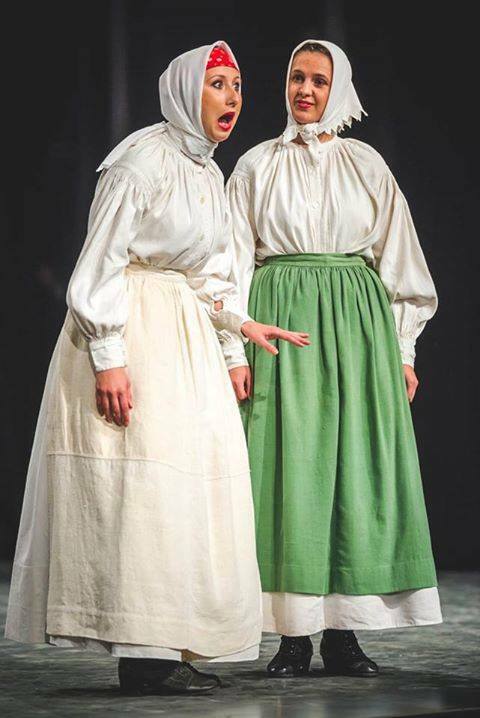 This costume looks very Balkan and is similar to those in close by Istria. A video of dances from this region. 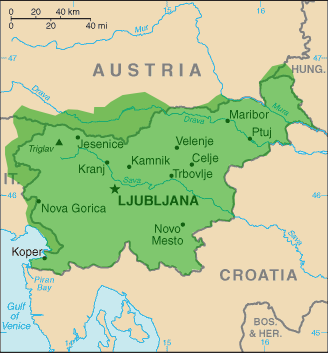 The westernmost region is the Primorska, or Littoral zone. Very little of this is actually on the Adriatic sea, most of it borders on Italy, but there is a sizable Slovenian minority in the adjacent part of Italy as well. 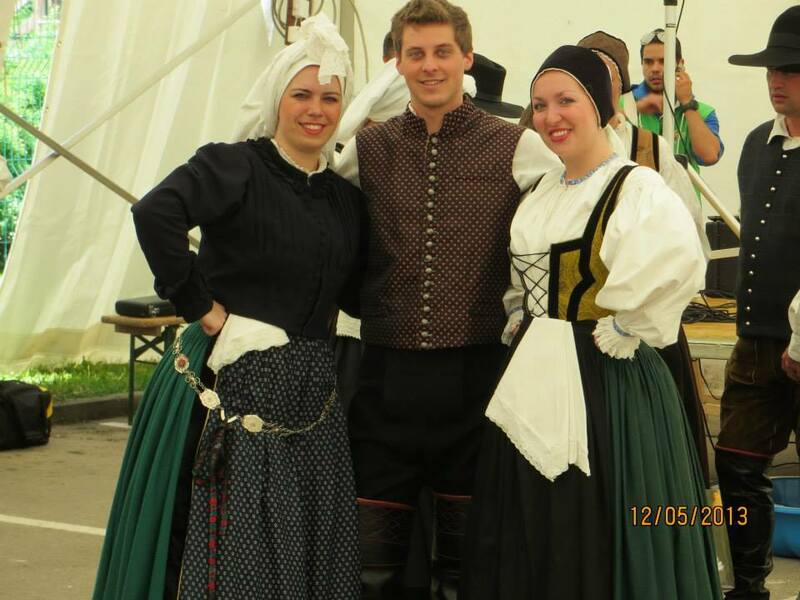 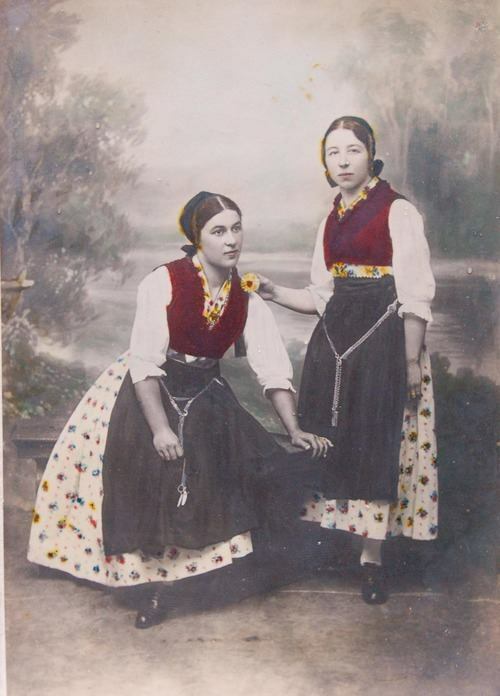 These costumes are from the village of Škedenj, or Servola, which is now in the Italian province of Trieste. 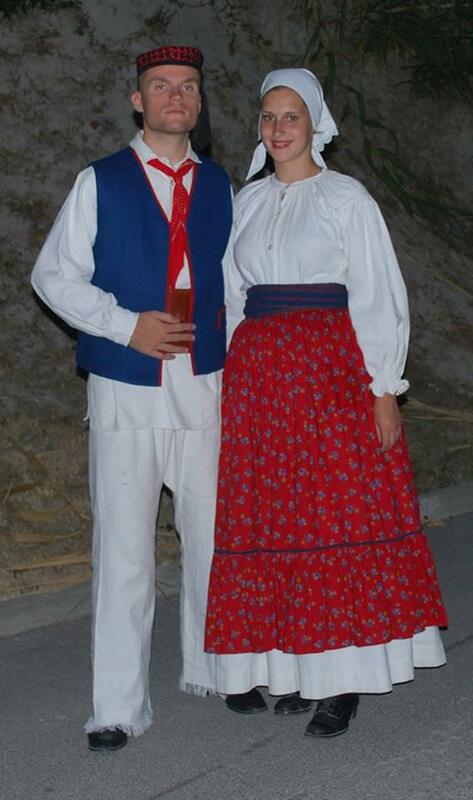 One can see obvious similarities to both Croatian Littoral and Italian costumes. 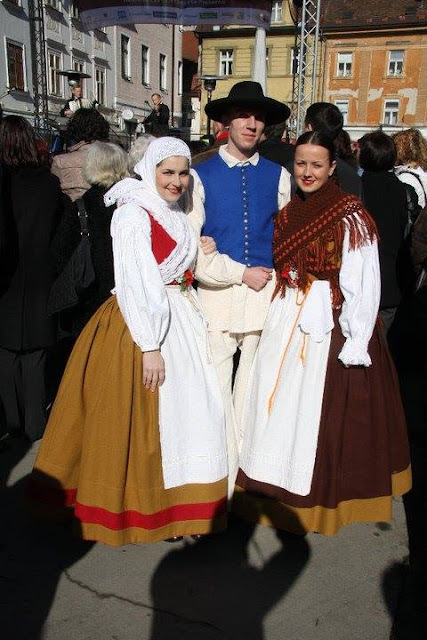 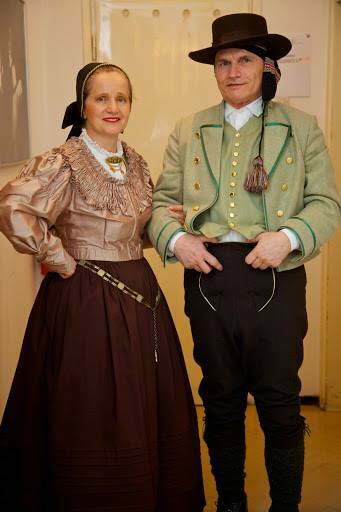 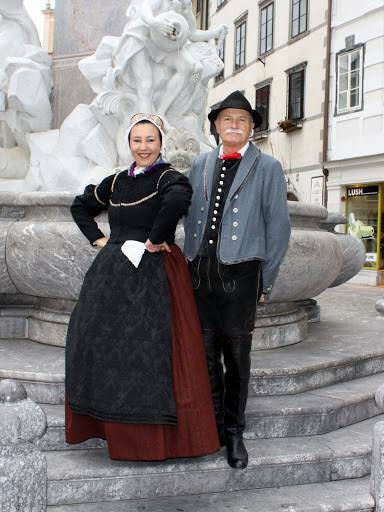 Some other Slovene costumes from around Trieste. 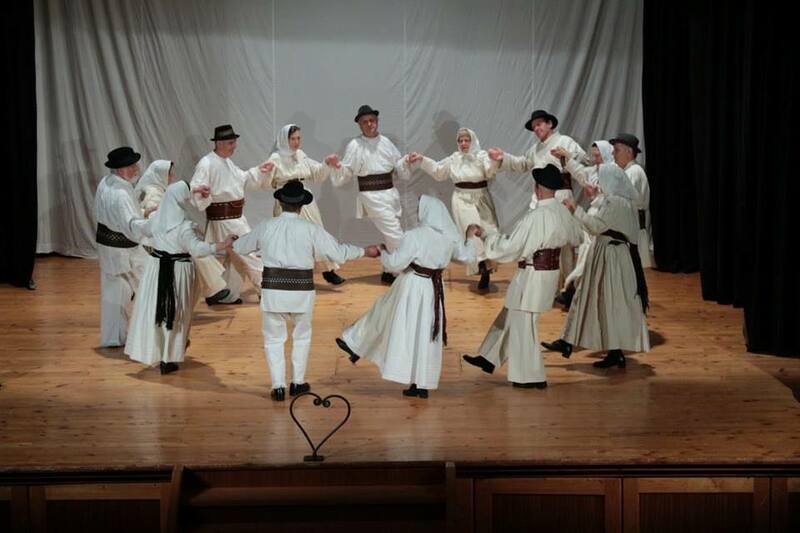 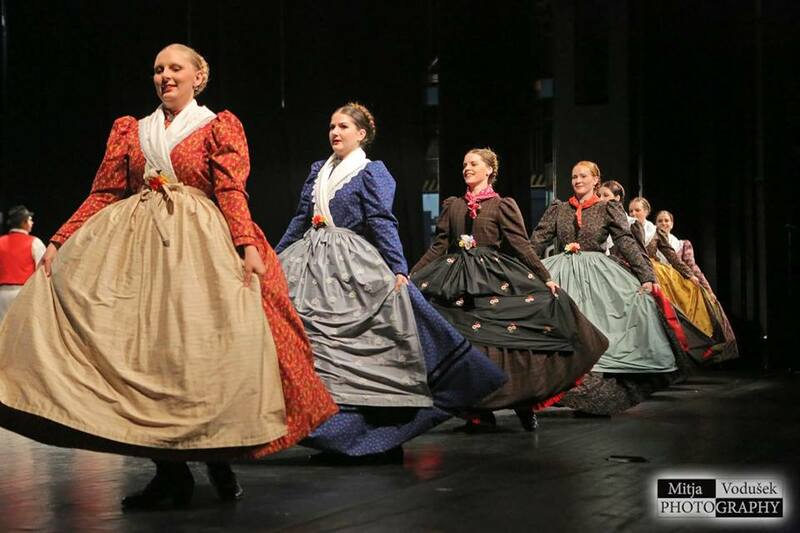 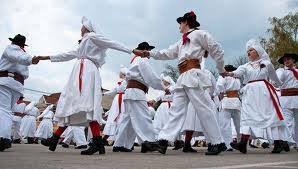 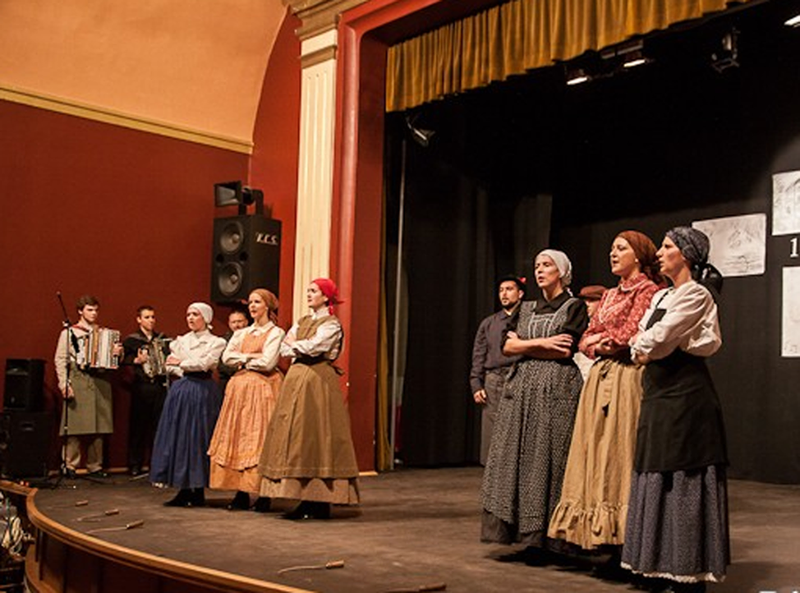 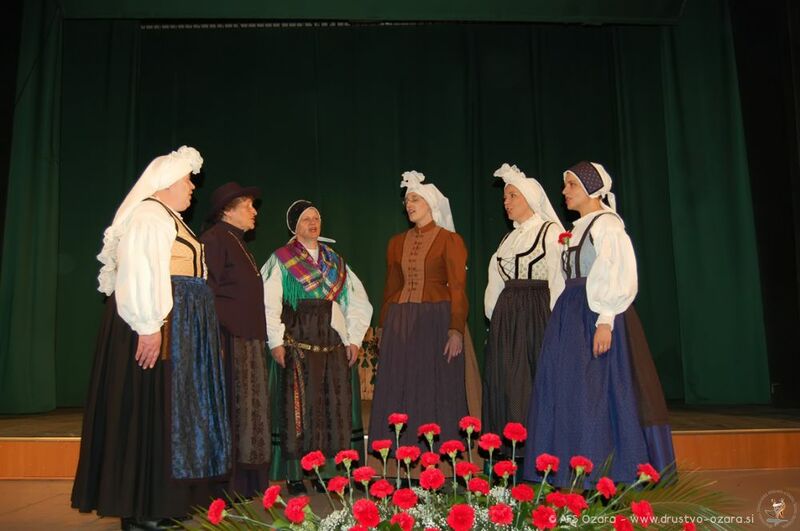 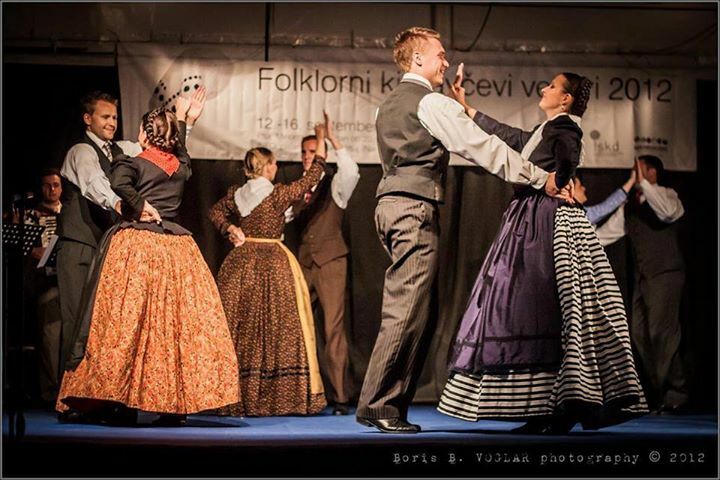 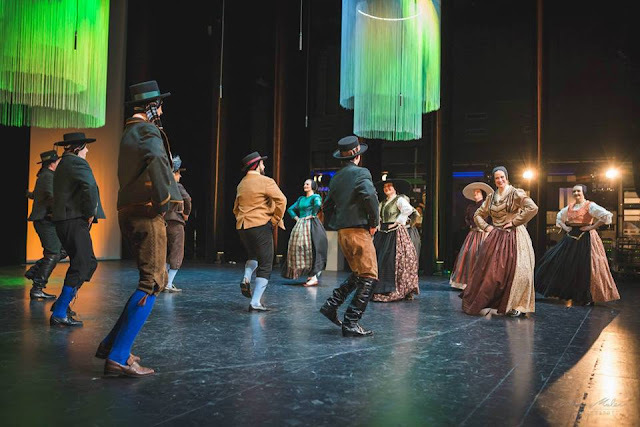 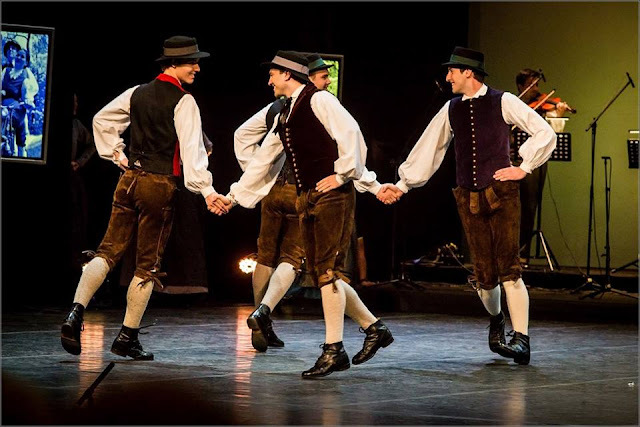 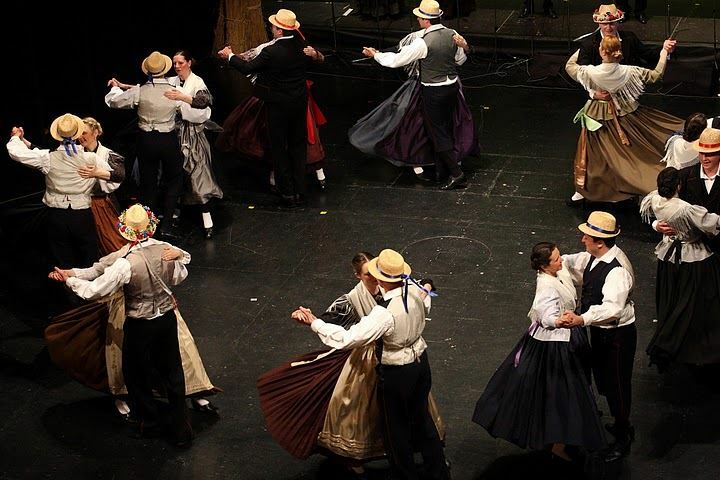 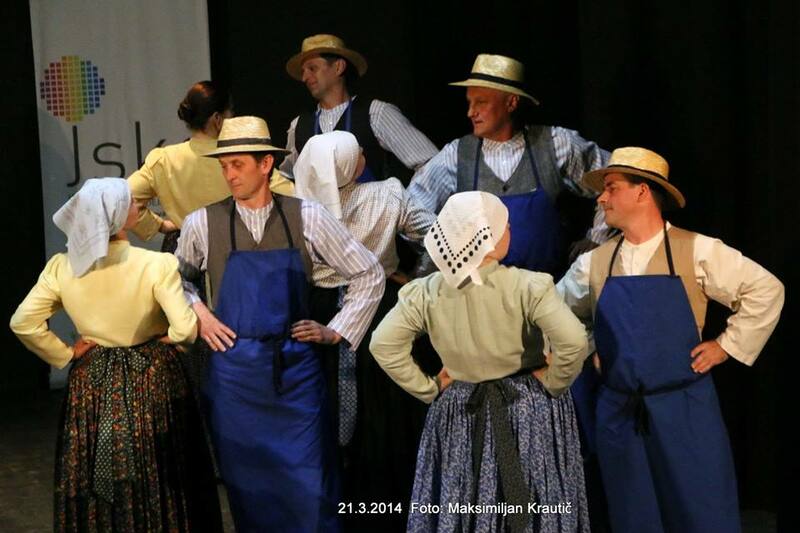 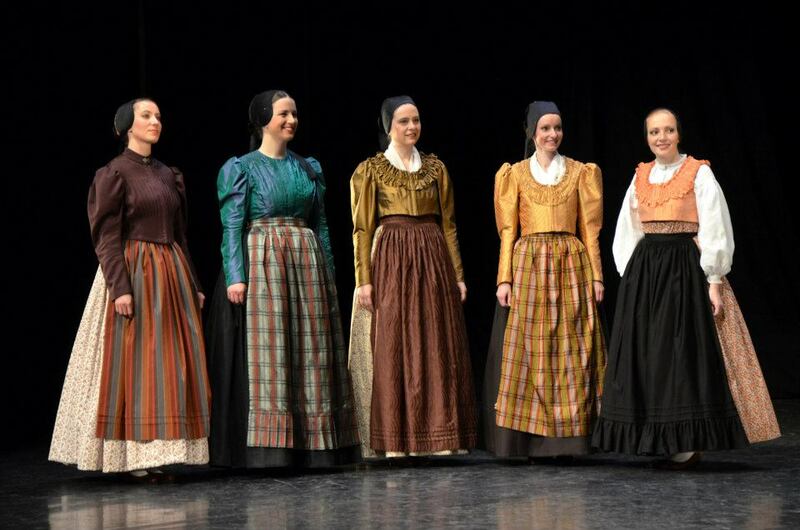 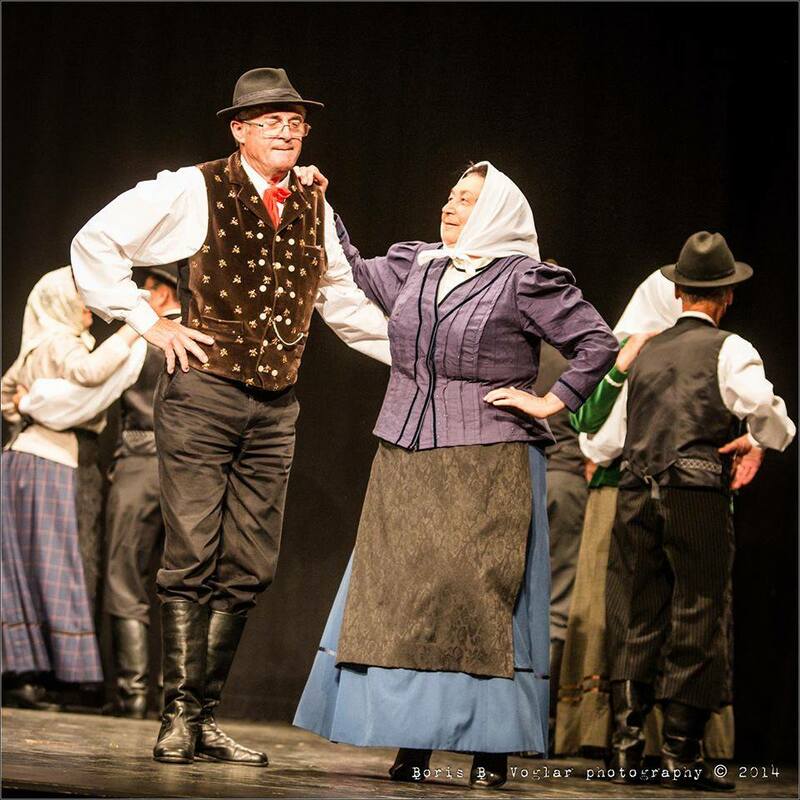 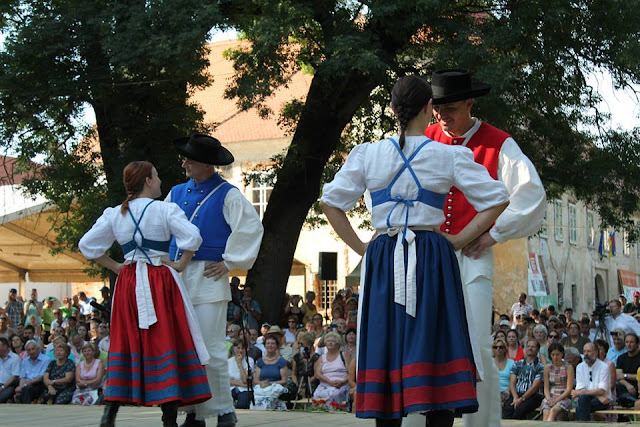 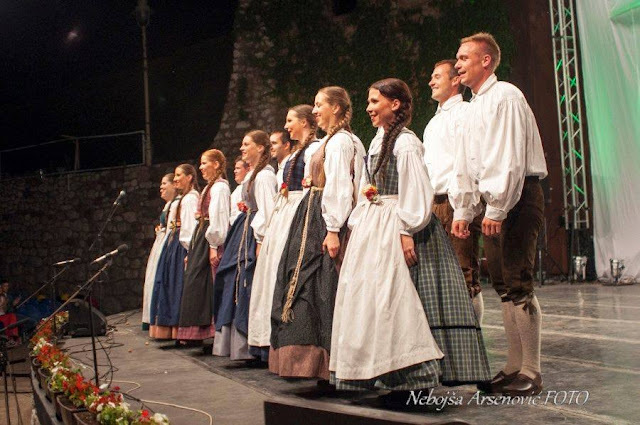 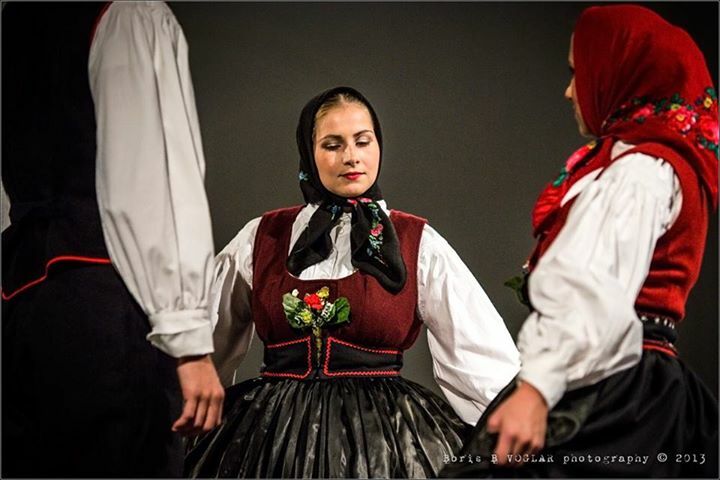 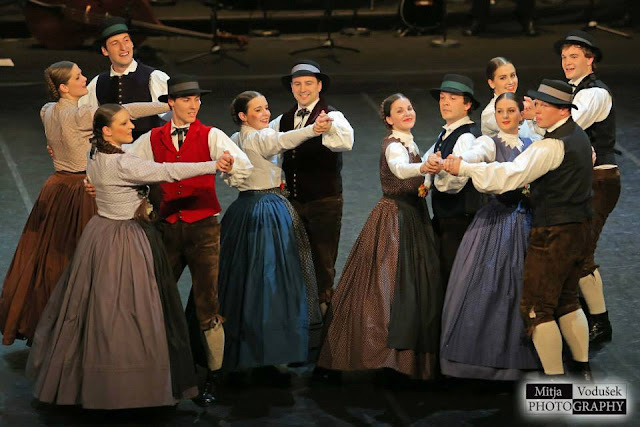 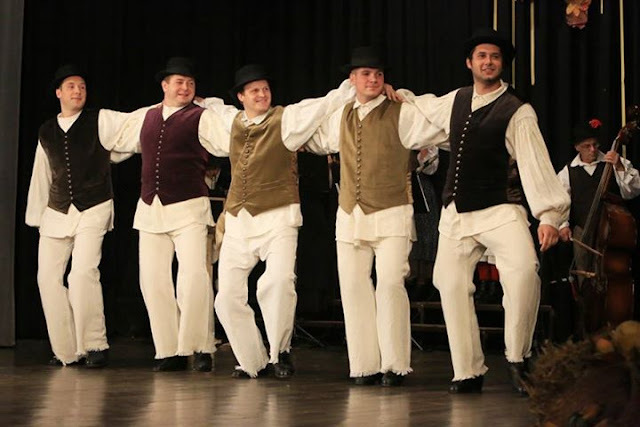 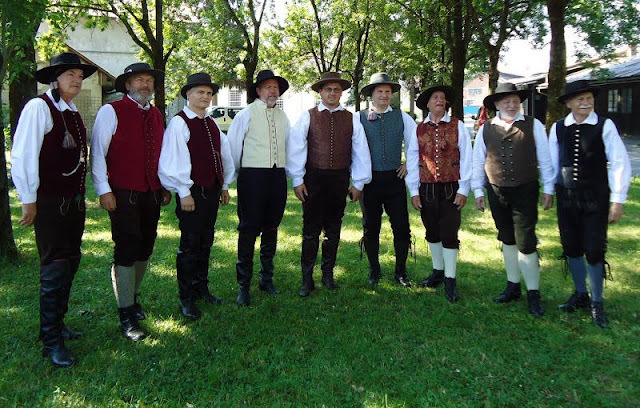 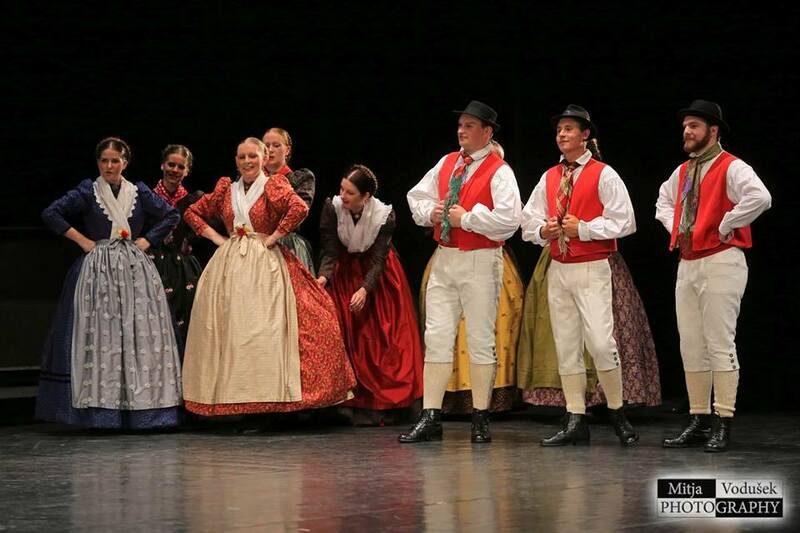 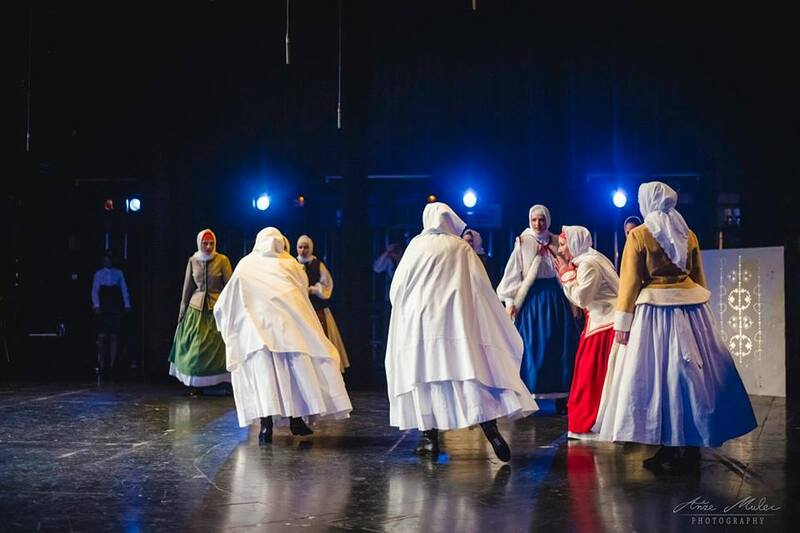 Videos of Slovene dances from the Istria - Trieste area. 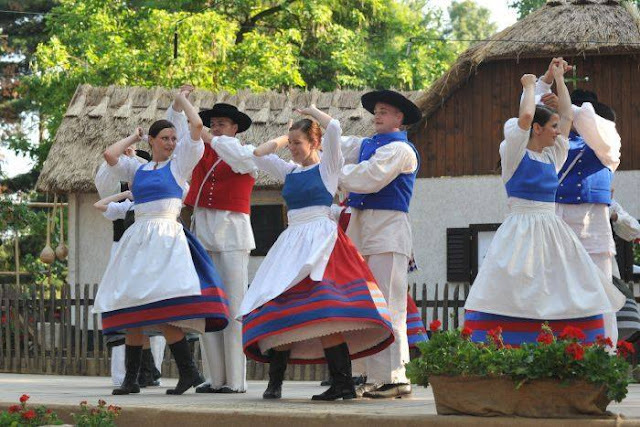 Further north, the border passes through the region of Gorica or Gorizia. 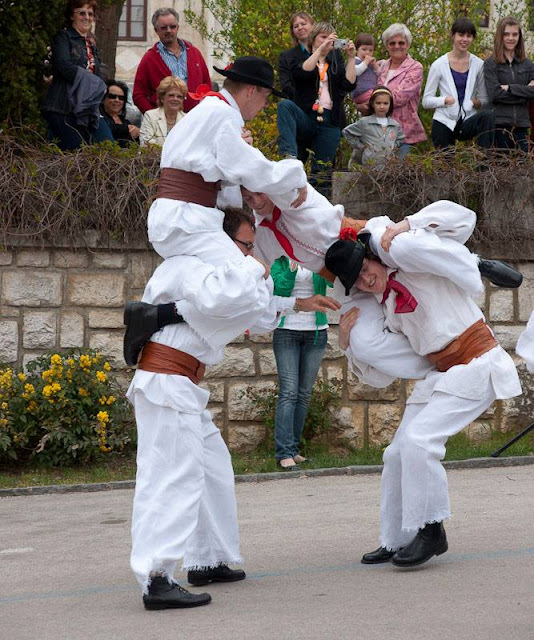 Solkan is a village on the outskirts of Gorica. 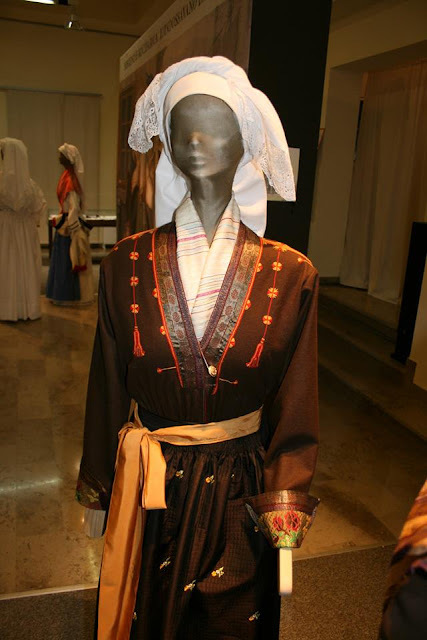 This is the costume as worn by folk dance groups representing the area. Video of dances from Gorica. North of this is Soška dolina, the Soča river valley, which more or less parallels the Italian border. 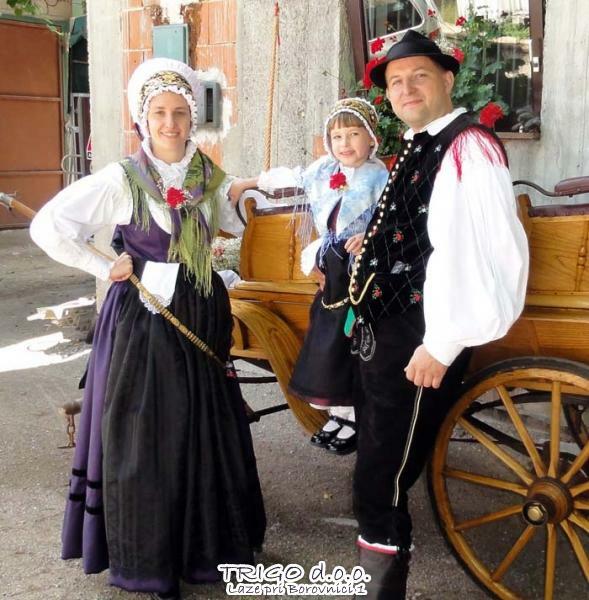 The most distinctive region is Val Resia, or Dolina Rezija, which is entirely on the Italian side, not far from the Austrian border. The dialect spoken here has its own orthograpyhy and is not intelligible with Standard Slovenian, and in fact, the people here consider themselves to be of a distinct ethnicity. Here are videos showing dances from the Resian Valley. 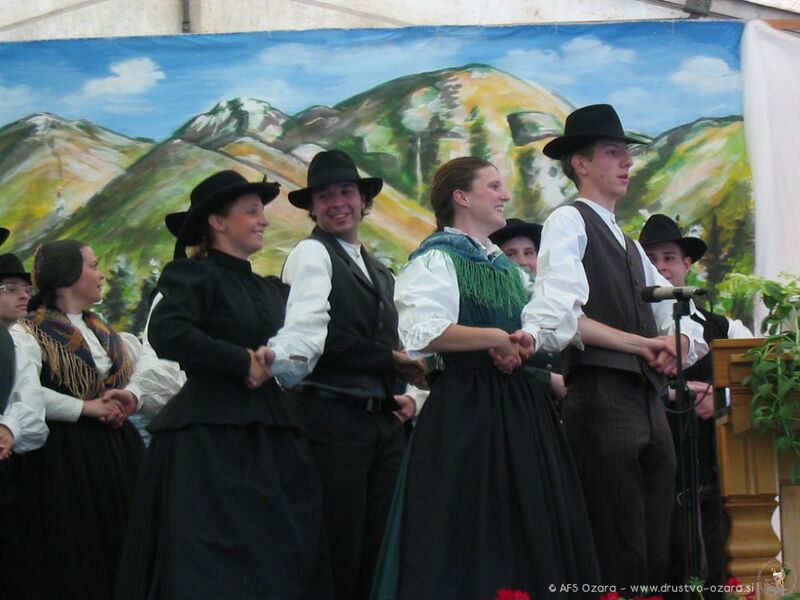 To the north, and lying mostly in Austria is the region of Carinthia, or Koroška. 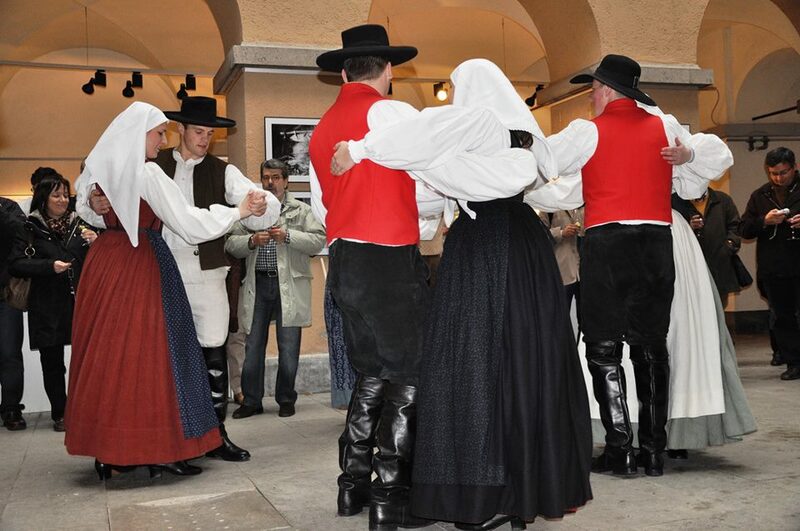 While the majority of the inhabitants are Austrian, Slovenes inhabit the southern part, and a small part of Carinthia is currently within Slovenia. Zilja Valley, Zilska Dolina or Gailtal. 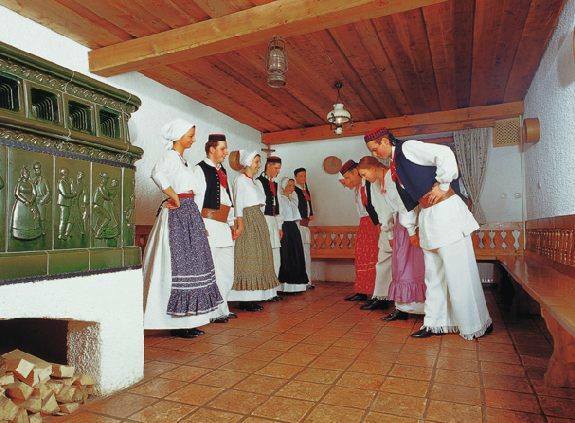 This lies in Austria but is inhabited by Slovenes. 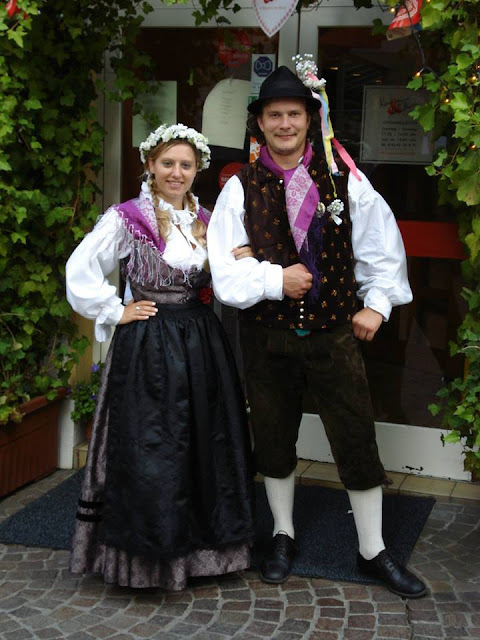 Some Austrians have also picked up this costume. 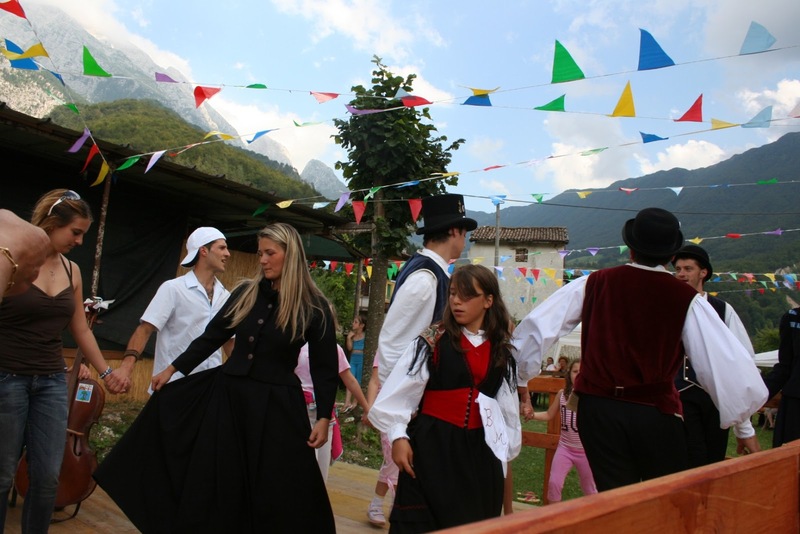 Video of wedding dances from the Zilja valley. 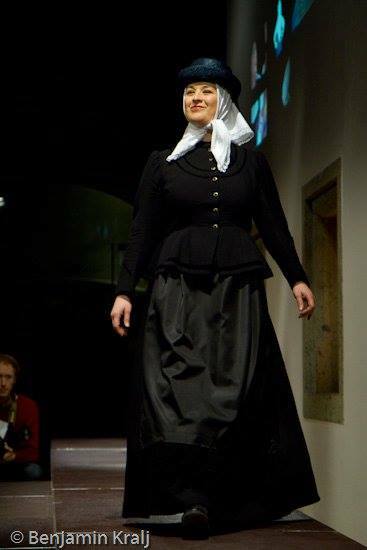 The bride, per old tradition, is dressed in black. 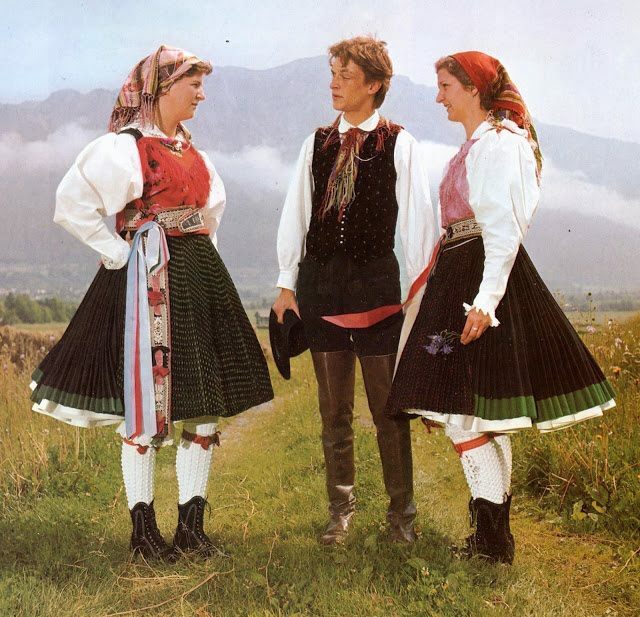 The Meža Valley, Mežiška Dolina or Mießtal. 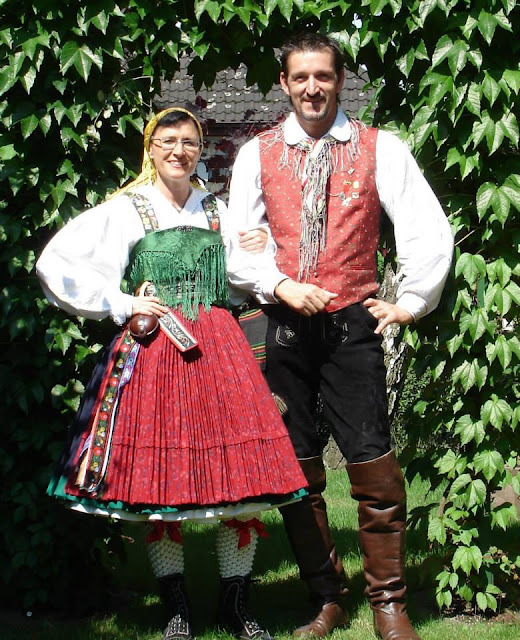 This currently lies within the borders of Slovenia. 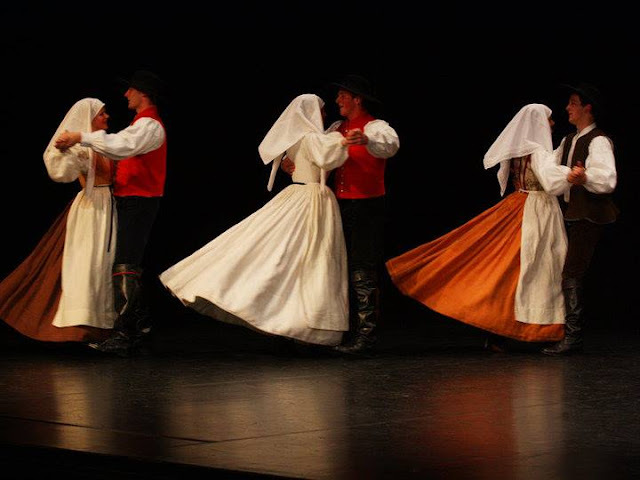 Videos of dances from the Meza valley. Štajerska or Styria is also mostly in Austria, but a significant part lies in Slovenia. 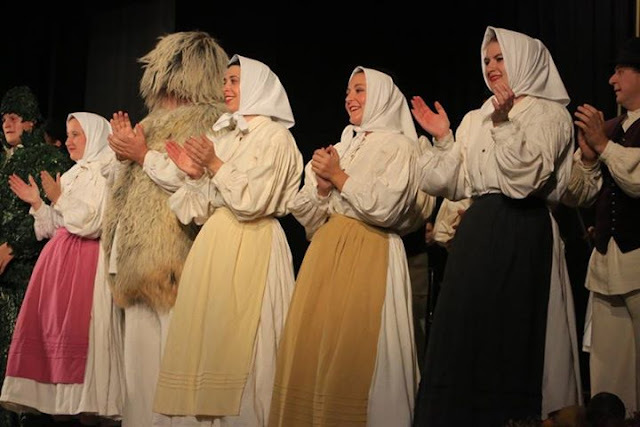 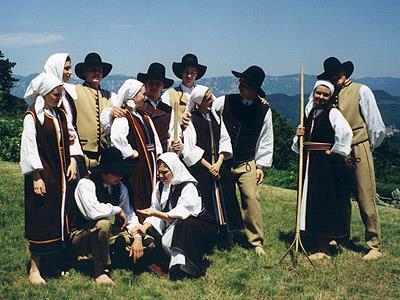 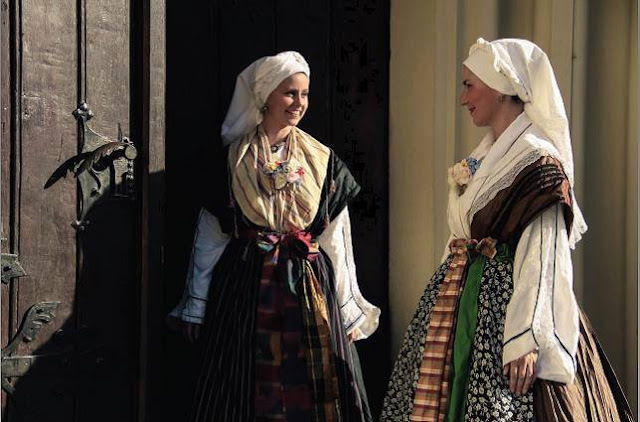 The Northern and Western parts have an Alpine costume, but the Eastern and Southern parts have a Pannonian costume similar to that of Southern Dolenjska and Prekmurje. Videos of dances from West Styria The first is set at Carnival time. 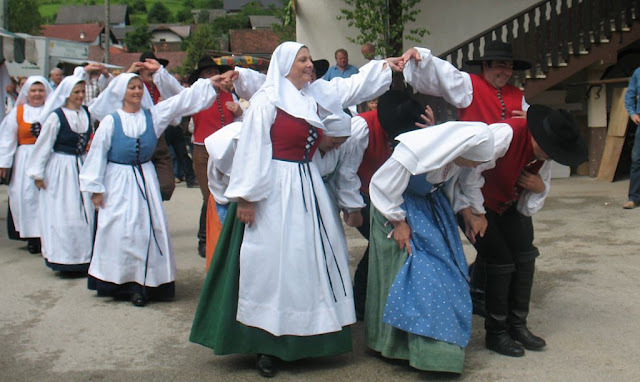 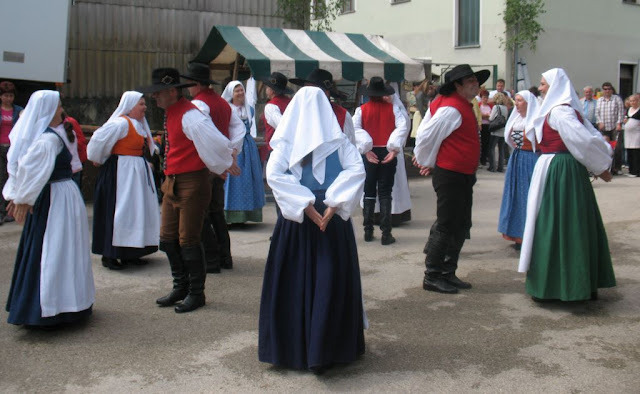 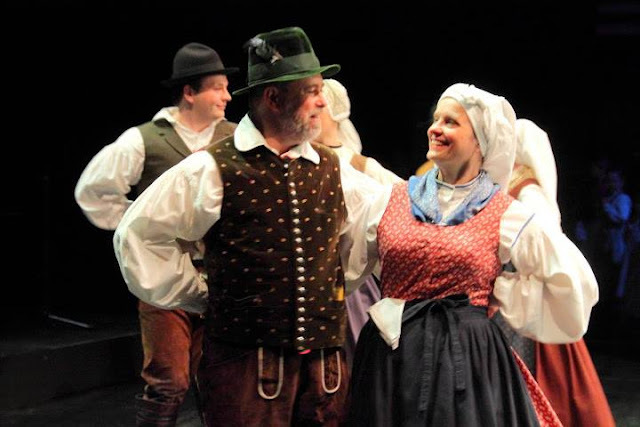 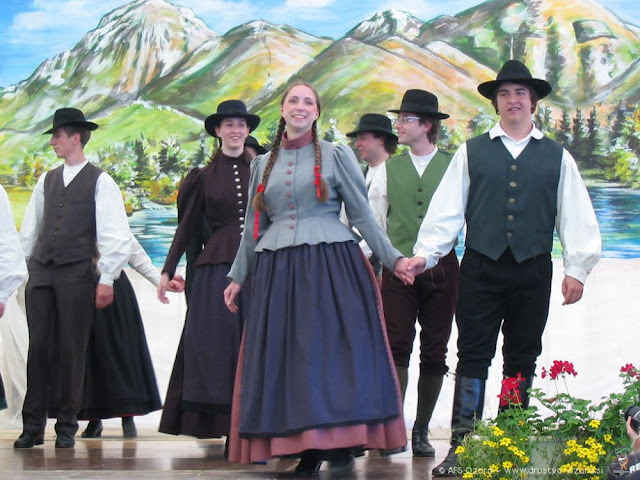 Video of dances from East Styria. 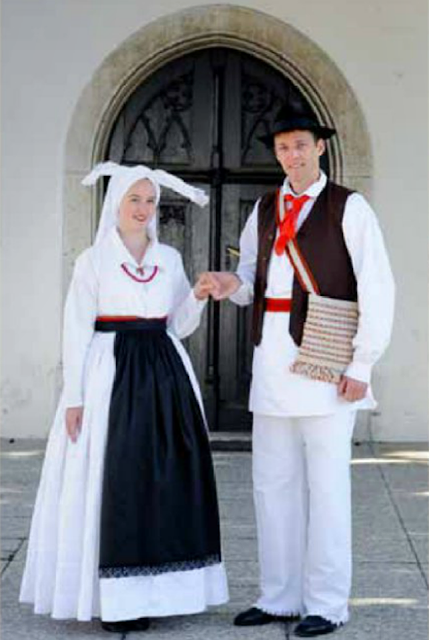 This is the Easternmost part of Slovenia, across the Murje river. 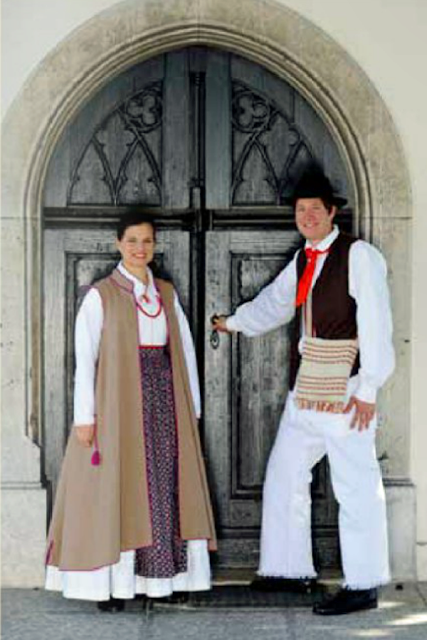 This region has a divergent dialect, and the costume is purely Pannonian. City dress was adopted early, as happened in many parts of Slovenia. 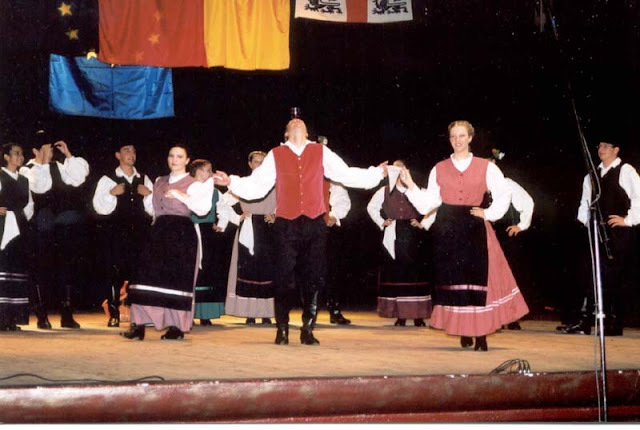 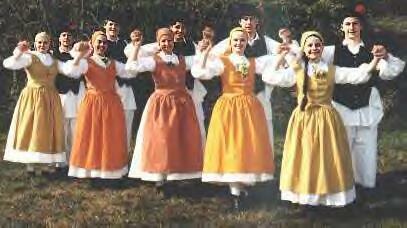 A set of dances from Prekmurje. 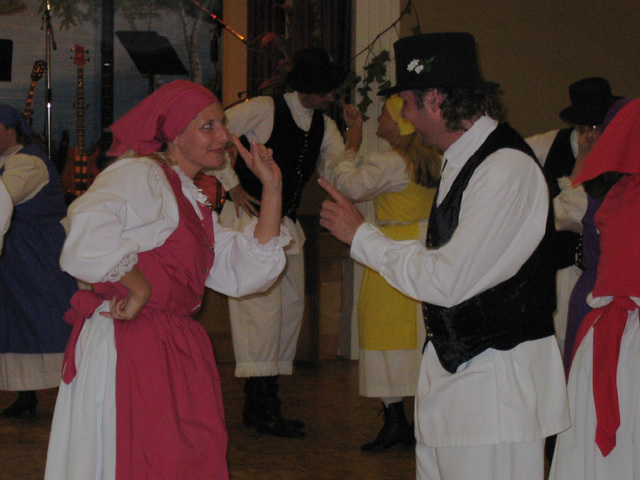 This is a representaion of a wedding celebration. 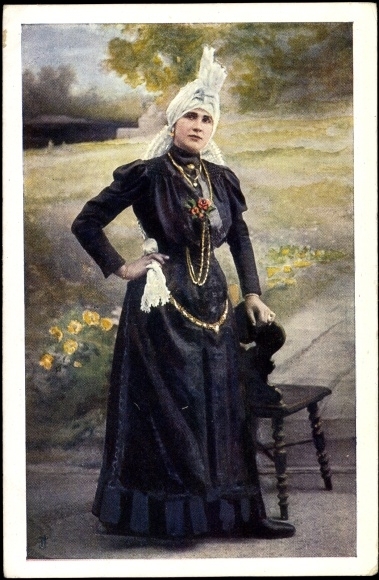 The Bride is all in black with a white wreath and corsage. 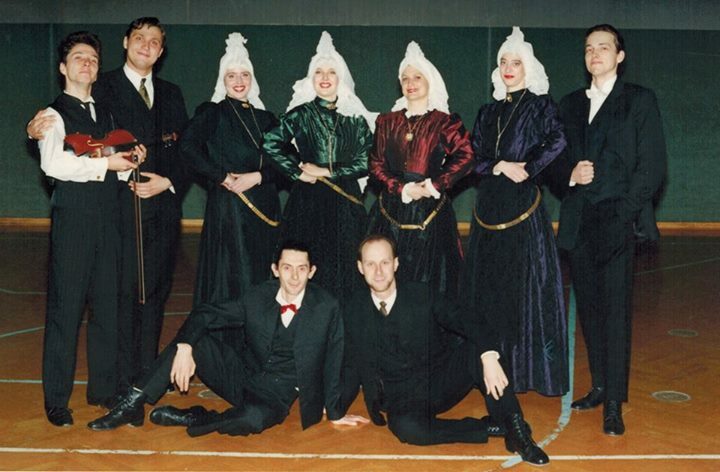 The Groom is likewise dressed all in dark colors. 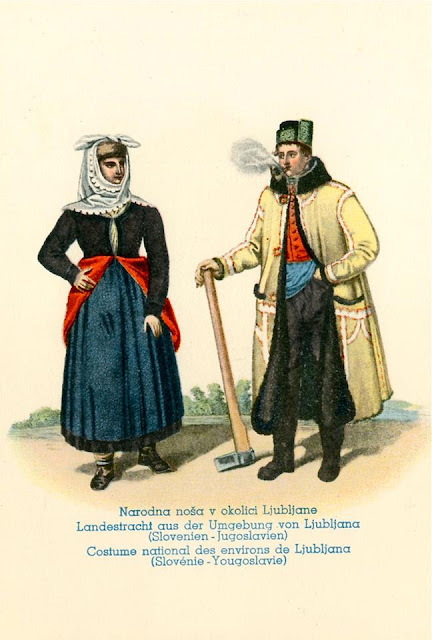 Some Hungarian influence may be noticed. 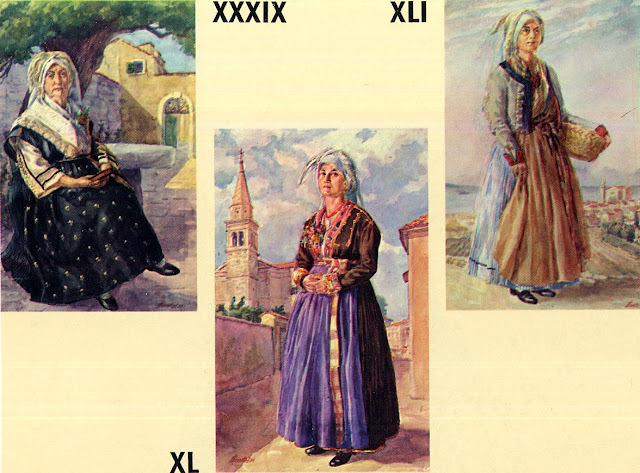 I drew upon many sources for this article, both print and online. 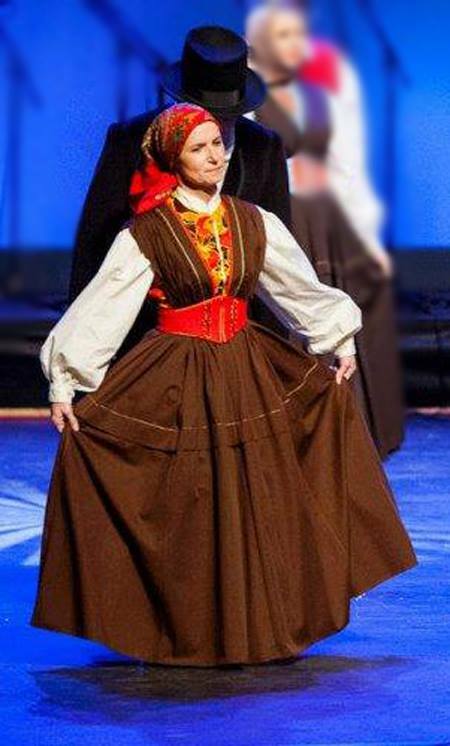 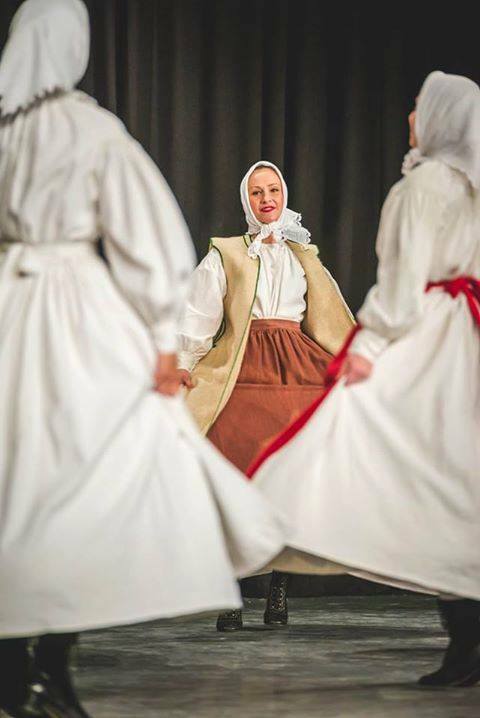 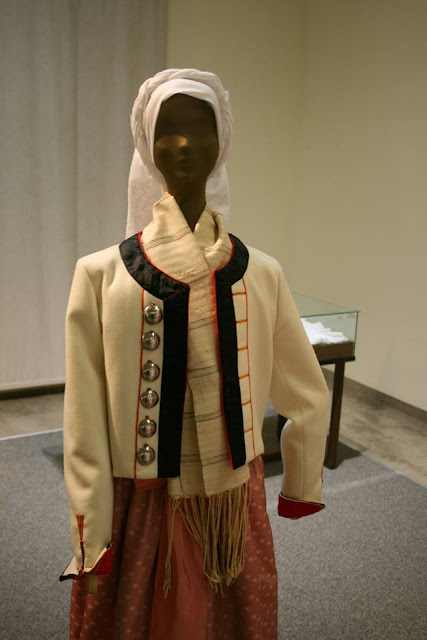 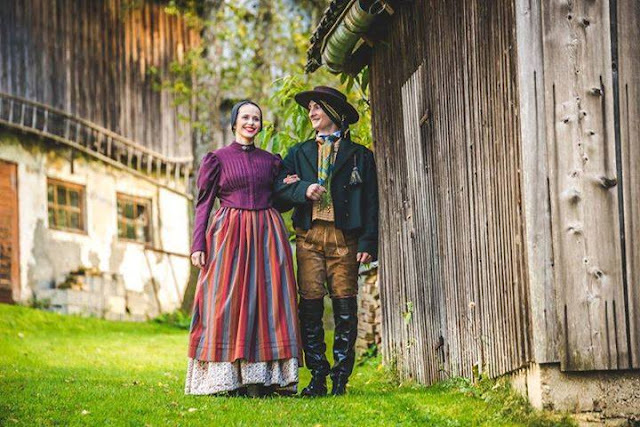 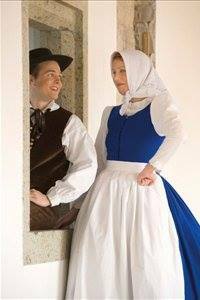 One of the best sources of information on Slovene Folk Costumes is the Facebook page Slovenska Ljudska Nosa. I highly recommend it. 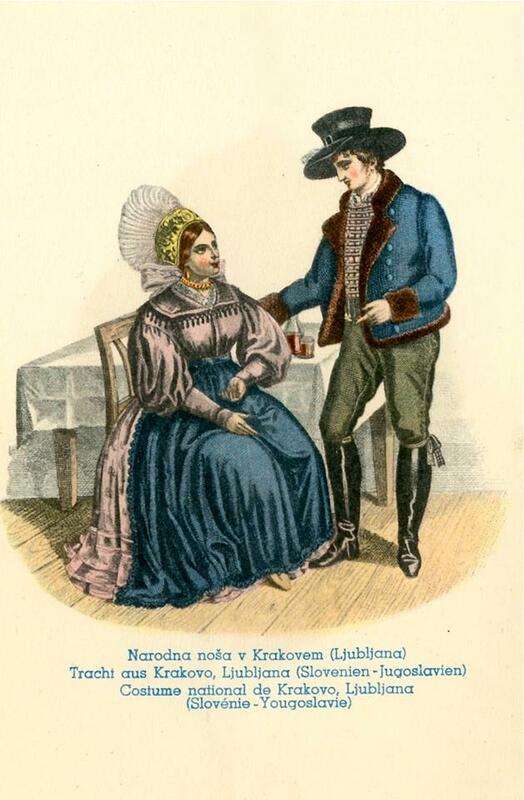 It is, of course, mostly in Slovene. 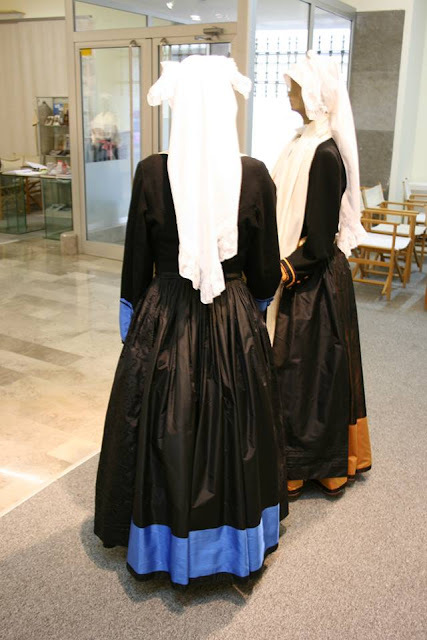 Please visit them and like them. 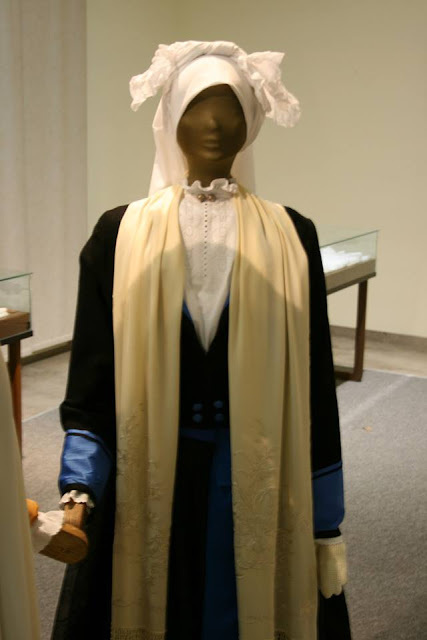 I enjoyed reading your blog!! 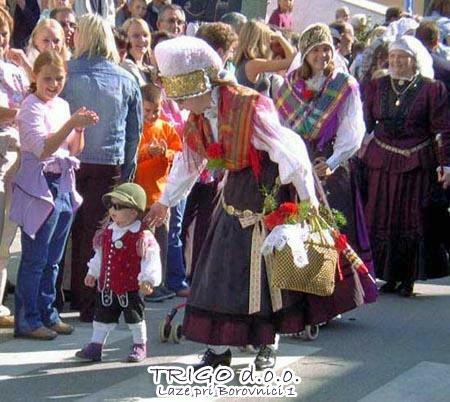 :) nice work! 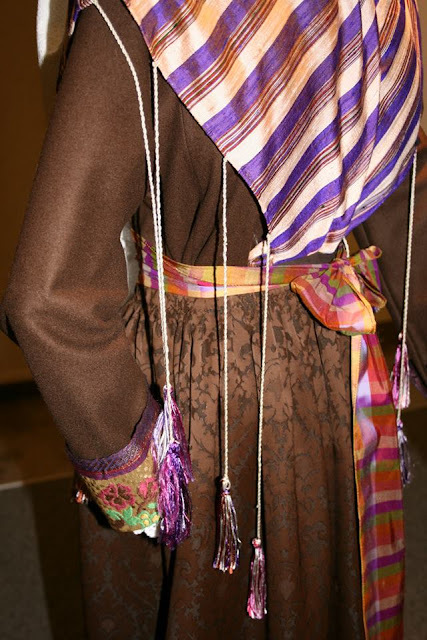 I pinned. Would love to use you as a guest blogger for my Slovenian blog, www.iheartslovenia.com.